Merge Your Business with Modern Mechanical! If you're looking to sell your business you should talk to us! We've been voted Best of Loudoun and one of DC's best places to work! Looking to Retire or Sell Your Business? Selling your business and moving onto the next chapter of your life is both exciting and stressful. Your future, as well as the future of your loyal customers and employees, is a serious consideration. The Modern Mechanical Family of home services companies, recently voted one of the best places to work by the Washington Business Journal and a Best of Loudoun award winner, means you’re joining forces with a winner and will ease a lot of your worries when you merge your business with our winning brands. 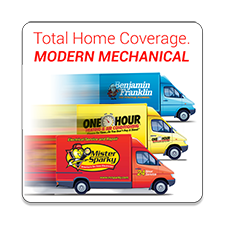 Our service is provided under three powerful brands; One Hour Heating & Air Conditioning, Mister Sparky Electrical, and Benjamin Franklin Plumbing. Why Sell or Merge with Modern Mechanical? Modern Mechanical is a fast growing, professionally managed home services provider with a simple goal; to become the undisputed value leader in the home services market in Northern Virginia providing outstanding service to our friends and neighbors (our customers). To this end, we are looking for quality partners (you) who can help us more quickly reach our goal. If you’re ready to start the next chapter of your life by merging your home services businesses with Modern Mechanical we want to talk to you! All inquiries will be held in the strictest confidence. Get in contact with us for a confidential discussion.